I must say that although I am all too fully aware that we need to step it up in the running department, the swim was an eye-opener for me in terms of its physicality & specific demands. I'd say that we need to do a GREAT DEAL MORE WORK on training our athletes to meet the actual demands of competition in the swim. The leaders in both the men's & women's races lifted their heads out the water almost every 5 strokes - that's very specific & must demand a high level of both skills & fitness. One of those swimmers was our own Sarah Haskins who had the swim of her life to come out almost too far ahead of the pack all on her lonesome!We also need to look into having a greater section of our gene pool in the USA participate in draft legal triathlons. Sure I know it is dangerous to a certain extent, but drawing athletes from a background of time trialing on the bike, into the sport of criterium style cycling is no way to apply the law of specificity. The difference between an animal that can put out an hour of maximum constant power in an isolated setting & the requirements of the draft legal racer, being masses of pace changes over a great variety of intensities in a much more technical setting with high speed cornering, plus the tactics of bunch riding, drafting, breakaways, etc. is vast. If cycling can have its categories that need to be graduated to, why can we not work with them & accredit our athletes in the same way - in this way we can have them race knowing that they are at least riding with athletes that have acceptable cycling skills. I am convinced that a whole new type of athlete will be attracted to the sport - athletes that may provide us with talent up to the demands of a world championship triathlon bike ride. These may be athletes who love the cut & thrust of crit racing & don’t see it as a necessary evil to get to the run in a position to do well. We have good riders who can swim & run, but too few.The US has a phenomenal collegiate & national swimming infrastructure - year after year, Olympics after Olympics the USA produces incredible swim teams. This year the US even produced a one man team that took home more medals than any other country's team combined! This is both a boon & a blessing for USA triathlon: We produce the best swimmers in the sport. Trouble is that this brings athletes that were swim specialists & have somatypes more suited to the sport of swimming than triathlon. Swimmers are somewhat larger than triathletes, needing more upper body strength & mass, which is NOT a limiter in the water, but hurts the triathlete, especially on the run. Somehow we also need to source our athletes from a domain that has taught them to swim from a very young age & developed very technically proficient swimmers, who have not necessarily gone on to full time swimming as their primary sporting activity. Let's face it - quality cyclists who come to the sport & have been cyclists for a while almost never make it to the top. I say almost, not because I know someone who has, but someone probably has! Many swimmers have made great triathletes, but in almost all cases their run has been a limiter to some extent. Similar to cyclists, but not quite as definitive are the runners. If they have not learned to swim effectively at an early age & developed a feel for the water, they are often doomed to be 2nd pack swimmers at best & spend their careers playing catch up on the bike, hoping the pack comes together & there are no significant breakaways up front. This in turn commonly leads to these “runners” not having as much run left after the herculean efforts required to make up lost time on the bike. 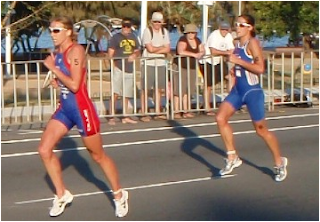 · Create a situation/culture where triathlon is not a sport graduated to, like with so many of today’s top athletes who came from some other specialty, but rather a primary choice made by youngsters when they would have chosen football, basketball, swimming, etc. Athletes like Hunter Kemper & Matty Reed come to mind. There are about 5 such top early specialisers in the junior & U23 ranks that I know of currently – we need to ALL do our best to motivate kids to take up the sport. This seems much more common in Australia, a triathlon powerhouse, than here in the USA. This would mean introducing things like a more “professional” collegiate triathlon scene, complete with recruiting & scholarships. The bigwigs tell me that this may be the case as soon as 2012 for women—that would rock! Imagine our top collegiate coaches coaching these athletes as swimmers & runners – bring on the medals. Develop triathlon as a bigger school sport, like cross country or track. The sport grew from IM & many of the top performers today are graduates of the Olympic/ITU discipline – top tri names like Michele Jones, Macca & Sam McGlone are but a few. Trouble is kids should not be drawn to these longer races too early, but rather start in the sport much younger in the short races – develop their skills & love of the sport & then move on later to the longer races. It is time to lay down the age old grudge against draft legal racing – there is room for both & ultimately I believe that the draft legal short distance triathlon will ultimately help the US regain its top spot in the long distance races, especially IM. Hmmnn! Now I’m thinking too much again about how to inspire coaches to step their game up one more time; again & again! As a parent of two youth and junior ITU triathletes I can tell you that there has been a huge increase not only in the number of competitors at the National ITU events over the last few years, but in the swim and run talent level of these young athletes. I completely agree that making triathlon a scholarship sport at the collegiate level will increase the talent pool even more.